I’ve just got back from a trip to France where I stayed with Peter Graham, former film writer and now a food writer and translator, and the author/editor of books including The French New Wave: Critical Landmarks (1968, 2009) A Dictionary of Film (1964,1968), Classic Cheese Cookery (1988, 2004) and Mourjou: The Life and Food of an Auvergne Village (1998, 2004). Appropriately enough, we watched a vast number of films during my visit, while also consuming huge amounts of cheese and wine. French television, typically perhaps, is much better than the UK in the way it has an enormous number of film channels showing classics and art house movies on a daily basis. We managed to watch quite a few across three days including William Wyler’s moving post-war drama, The Best Years of Our Lives (1946) and two noirs: the over-the-top but enjoyable Ruthless (1948, Edgar G. Ulmer) and Otto Preminger’s last film noir, Angel Face, starring Jean Simmons and Robert Mitchum (to vary things a little we also watched, bizarrely, The Net, 1995 with Sandra Bullock). 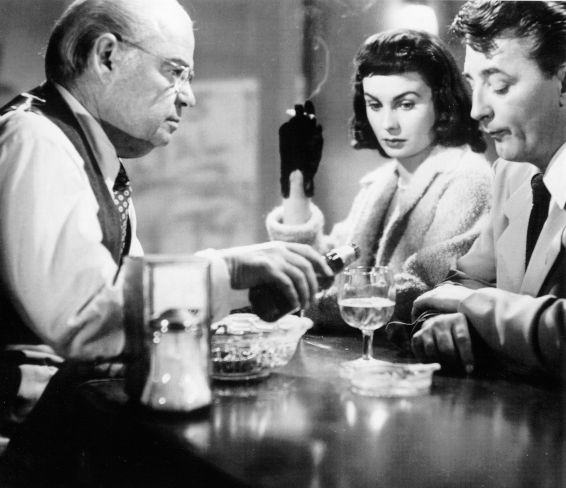 Mitchum turns in a typically laconic performance, but Angel Face is entirely Jean Simmons’s movie. Playing against type as a ruthless femme fatale, she gives a compelling performance as the manipulative and psychologically confused Diane Tremayne, the ‘angel face’ of the title. The film opens with an ambulance being called to the Beverly Hills house of novelist Tremayne (British actor Herbert Marshall) and his wife Catherine (Barbara O’Neill). Catherine is unconscious and suffering from gas poisoning – but was it an accident, attempted suicide, or, attempted murder? When Frank (Robert Mitchum) one of the paramedics, encounters Diane, the daughter of the house, she soon becomes hysterical. He slaps her and her response is to give him a hefty slap back. “Now look, the manual says that’s supposed to stop hysterics”, says Frank. “It doesn’t say a word about getting slapped back”. Of course the slap is a prelude to a destructive love affair that will end badly for all concerned. Later that night, Diane turns up in the diner where Frank goes when he finishes a shift. 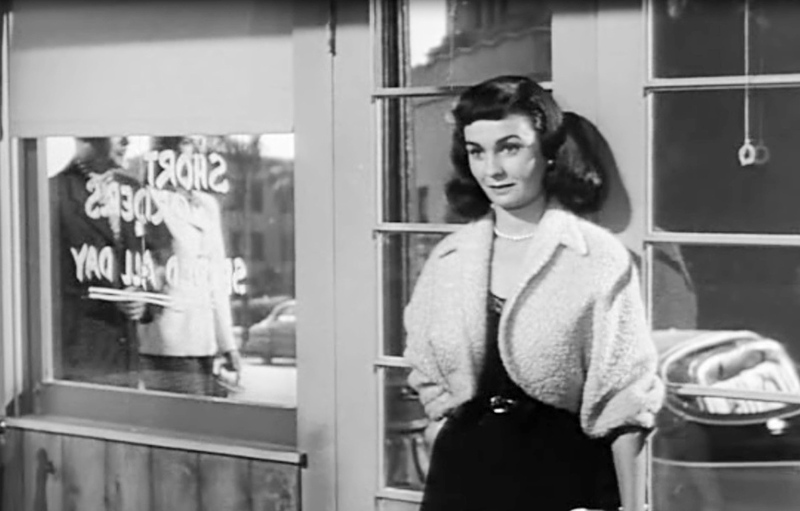 She persuades him to cancel a date with his steady girlfriend Mary (Mona Freeman) and take her out to dinner instead. She promptly reels him in by letting him drive her sports car, and by promising to help him realise his dream of setting up his own racing car repair business. Soon Frank is ensconced as the family chauffeur and wrapped around Diane’s little finger. He tries to resist but proves powerless in the face of her angelic beauty until it is too late. Frank observes that Diane (who will be “twenty, next month”) doesn’t drink or smoke, although we later see her relish a cocktail made at home by Japanese butler Ito (Frank Kumagai) (we see her smoke too). The scene starts with Ito slowly stirring an iced jug of some connection before serving it to the family: “Now, what is it tonight?” asks Diane. “Don’t tell me, let me guess. 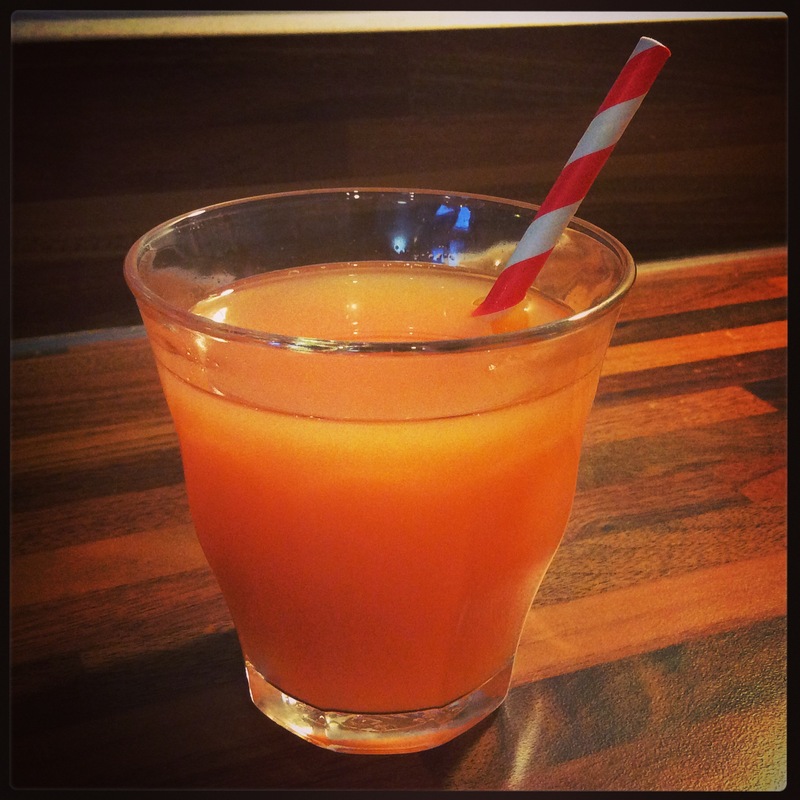 Pineapple certainly…. orange…. what’s the other? “It’s crème de fraises, dear. I’m sure you knew it all along” cuts in her step-mother. Upon seeing this scene I immediately knew that I had to try and make what I have dubbed an Angel Face cocktail. It’s the perfect drink for the teenage Diane, sweet on the surface but also sharp and acidic, with a hidden adult twist. Being in France made the purchase of crème de fraises (strawberry liquer) that little bit easier. The quantities I settled on were 3 parts pineapple, 1 part orange and 1 part crème de fraises. This gives the dominant pineapple note that Diane immediately identifies. Stir in a a jug with ice and serve in fairly small glasses (it is quite sweet), with extra ice if required. You could garnish with a strawberry, and to be truly authentic I would also suggest using freshly squeezed Californian oranges.